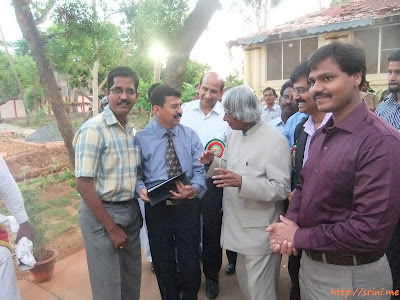 Dr.APJ.Abdul Kalam launching the FaceBook FanPage "Plastic Free Cuddalore"
"Plastic Free Cuddalore" has been the social media initiative by District Collector Mr.Rajendra Ratnoo IAS. Today it was launched by Former President, Mr.APJ.Abdul Kalam in the presence of Disctrict Collector Mr.Rajendra Ratnoo IAS, Deputy Collector Mr.Veera Raghava Rao IAS and Actor Vivekh at the Collector's Camp Office. Yesterday I got the call from the collector to work out the modalities on the online part of this campaign which is bound to make the Cuddalore district a garbage and plastic free district. I got to finish the FanPage and made it ready this afternoon. Very much proud that this initiative was launched by the most noblest man of India, the former president Dr.APJ.Abdul Kalam. It was really a proudest moment of my life time to stand next to such an eminent personality as my social media initiative gets launched into the online world. The FanPage could be reached at PlasticFreeCuddalore. Please subscribe to that page and keep tune to the interesting happenings in the pipeline which is going to make the district a clean and green one in the near future. Very Nice..!! Congratulations for such an opportunity!